It's nice to see that other people suffer the same affliction as I do. No, I'm not talking about eating too much nor am I talking about incessantly taking pictures of my noodles either. I am referring to the mindless purchase of Groupon-like deals. At the time, they seem irresistible, hence the "how can I possibly lose?" mentality. Well, Ginseng bought a few of them and had been bugging me to help her use them to no avail. 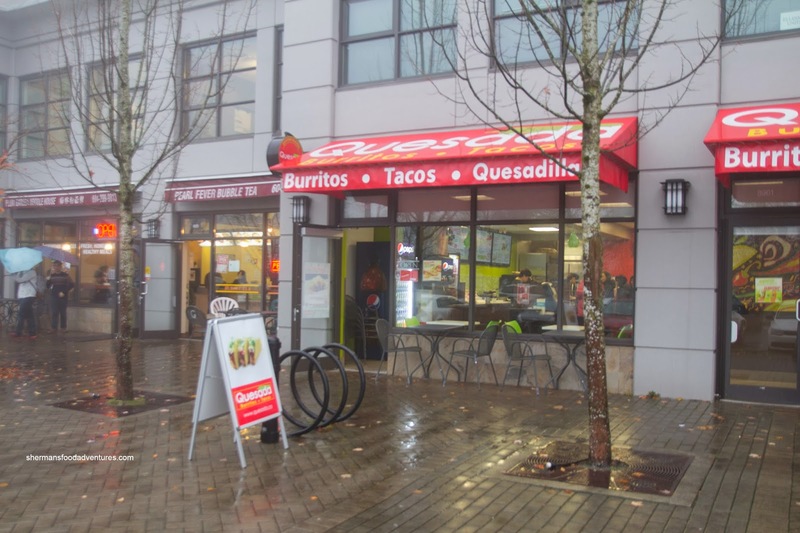 Finally, I relented and we headed up to SFU to try out Quesada. 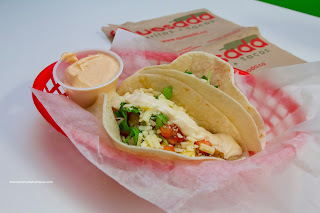 Unlike my recent visit to Cinco de Mayo, Quesada is closer to Tex-Mex than authentic Mexican. No matter since each of them have their own merits. Ginseng went for their Hard Tacos with chicken and steak complete with all the fixins'. Everything was fresh, but the proteins were quite dry and relatively cold. I went for the Soft Tacos and it was pretty much the same issue. I went for one each of the fish (rubbery and cold) and steak (chewy and cold). The one saving grace was their sauces which were indeed spicy as advertised. The really nice owner passed on a super hot sauce (seen on the side) which was potent. 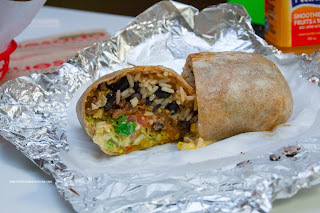 I also tried out their small Burrito with a whole wheat shell. This was not bad as the ingredients were vibrant and crisp. 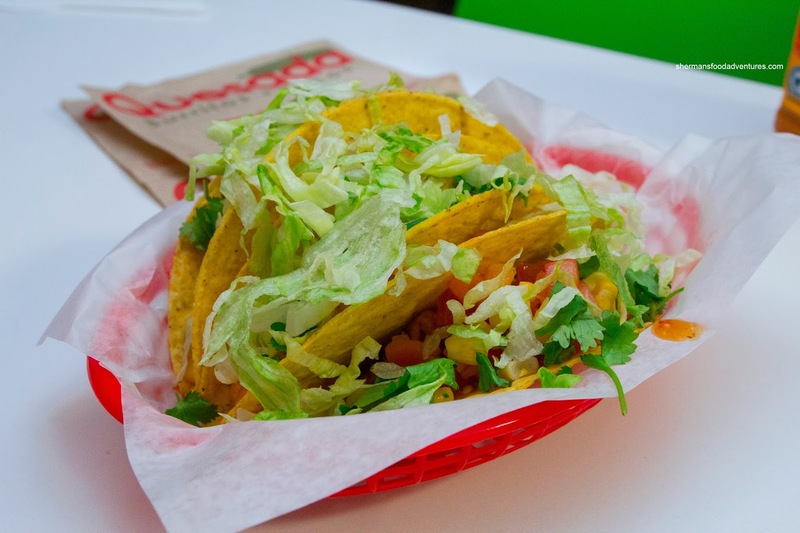 A dash of the hot sauce and the whole thing came alive. And sounding like a broken record, the pork filling was not exactly warm. 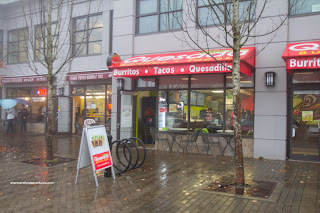 Yet in the end, the place does the job, especially for hungry SFU students who want to fill up for a reasonable price. I went through a phase where I was buying up Groupons like crazy. I couldn't keep up and a lot of them ended up expired..... so they were no deal in the long run. I avoid them now.... until I use up all the expired purchased ones I'm not going to buy any new ones.